Your skin is being exploited and weaponized against you. You skin is a tool in Satan's toolkit to get you to curse God. Stop reading this article immediately and take a look at your skin. You skin is amazing! God designed your skin, which is the largest organ of your body. Your multi-layered skin provides you a container for the Divine Image and your internal Spiritual uniqueness, a barrier from the outside world, transmitter and receiver, a sensory device, a tool that Satan can use to get you to curse God, camouflage, an indication of our spiritual condition (and physical), communication system and power supply, and an interface system with your environment. The Old Testament forbids tattoos and markings, considered in the Bible worship of the dead, and in Revelation a mark accepted in two locations of the body will spell eternal damnation. As we shall explore in this article, your skin is being exploited and weaponized against you. With sweat ducts in human skin are helically shaped tubes, filled with a conductive aqueous solution. A computer simulation study of these structures in millimeter and sub-millimeter wave bands show that the human skin functions as an array of electromagnetic low-Q helical antennas. Experimental evidence is presented that the spectral response in the sub-Terahertz region is governed by the level of activity of the perspiration system. It is also correlated to physiological stress as manifested by the pulse rate and the systolic blood pressure. In fact, ﻿your skin is a highly conductive, fast proton transportation system and network over its entire ductile surface. Your skin is so sensitive that your physiological and psychological condition can be ascertained by your perspiration system, much like a thermometer measures your body temperature. Your sweat glands respond to various external and internal environmental factors, such as pH, poisons such as snake venom, chemicals, toxins, frequencies, and more. In simple terms, your skin acts both as a thermo-regulator and naturally as an antenna. Researchers at Drexel University are going to exploit the natural qualities of your skin using their invisible and novel spray antenna solution of titanium or molybdenum, bonded with carbides or nitrides called MXene, on the same level as the antennas in today’s mobile devices and routers. As you see in the video above MXene is mixed into water and then applied to anything and everything making it an antenna for various sensors or as in the case of skin, increasing its natural antenna qualities. The spray-on antenna significantly reduces the size of the antenna structure from 3,000 nm to 100nm and has a higher conductivity than carbon nanotubes. "The ability to spray an antenna on a flexible substrate or make it optically transparent means that we could have a lot of new places to set up networks,” said Kapil Dandekar, a professor of electrical and computer engineering at Drexel. “This technology could enable the truly seamless integration of antennas with everyday objects which will be critical for the emerging Internet of Things." 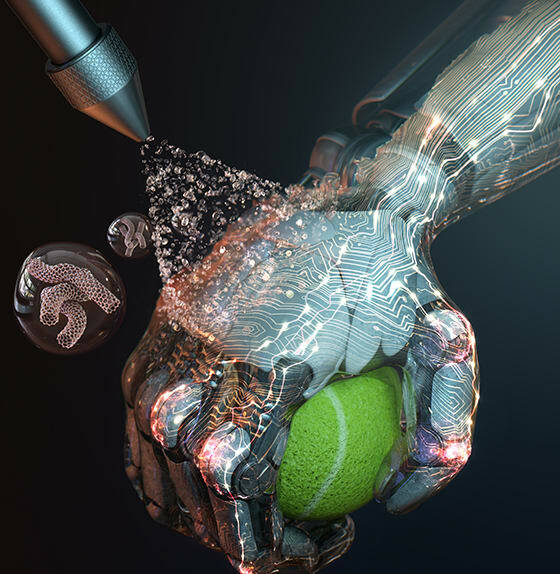 The other interesting breakthrough is an electronic skin that can be applied in a sprayable solution to robotic parts. Developed by a team from the Korea Advanced Institute of Science and Technology research team, the technology is a stretchable skin-like tactile sensor that can be sprayed on irregular-shaped objects such as robot parts. "Our electronic skin can be mass produced at a low cost and can easily be coated onto complex three-dimensional surfaces,” said Professor Steve Park, co-lead of the research team. “It is a key technology that can bring us closer to the commercialization of electronic skin for various applications in the near future." Sprayable Tactile Sensors for Robots. Spray on antennas can provide a soldier on the battlefield instant communication ability but it can also be deployed in an aerosol and sprayed into the atmosphere turning anything that it comes in contact with into an antenna. Those of us who have been watching Geo-Engineering since the 1990's have been concerned about this aspect of that program. It has now come to pass. And then there are the creeping skin-tennas that work with your embedded or wearable devices enveloping you with wireless signals. Now, Scanlon and Conway have designed a version that that channels much more of its signal sideways by taking advantage of the “creeping wave” effect that allows waves to travel along a surface. The same effect is responsible for both a person’s ears hearing a sound only directed at one side of their head. National Center for Biotechnology Information (NCBI) has been conducting environmental research on the impact that 5G will have on the skin. Starting from July 2016 the US Federal Communications Commission (FCC) has adopted new rules for wireless broadband operations above 24 GHz (5 G). This trend of exploitation is predicted to expand to higher frequencies in the sub-THz region. One must consider the implications of human immersion in the electromagnetic noise, caused by devices working at the very same frequencies as those to which the sweat duct (as a helical antenna) is most attuned. We are raising a warning flag against the unrestricted use of sub-THz technologies for communication, before the possible consequences for public health are explored. Your skin is under assault as one of the last frontiers and barriers keeping us protected from being engulfed by the global beast system. 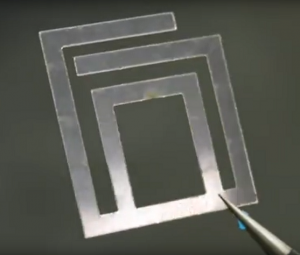 Microstrips for hard and soft skins using 3D print. Design, fabrication, and testing of a novel active skin antenna which consists of an encapsulation shell, antenna skin, and RF and beam control circuits. The antenna skin which consists of the facesheet, honeycomb, array framework, and microstrip antenna elements was designed by using Bayesian optimization, in order to improve the design efficiency. An active skin antenna prototype with 32 microstrip antenna elements was fabricated by using a hybrid manufacturing method. Gels In this study, we prepared two different human skin-mimicking gels and designed a small size dual band implantable micro-strip antenna for medical applications covering ISM and MICS bands in the light of recent studies. We developed gels to mimic the electrical properties of real human skin tissue and used these gels for in-vitro testing of the proposed dual-band implantable antenna. The recipe for the skin mimicking gels is composed of carbomer, sucrose, NaCl, and deionized water at several percentages. We note that numerical analysis of the proposed antenna carried our using CST Microwave Studio software. The characteristics of the human body as an antenna were investigated and the results were applied to Human Body Communication and radio-frequency radiation dosimetry. Human Body Communication (HBC) is a wireless communication technique, applied to Body Area Networks, that uses the human body as part of the communication channel to connect wearable electronic devices. Radio-frequency (RF) radiation dosimetry is the science of quantifying the amount of absorbed RF radiation power inside the human body when it is exposed to RF electromagnetic fields. In addition to applying the human body antenna characteristics in HBC and RF dosimetry to analyze and interpret measured and computed results, the derived knowledge was studied with the objective of applying the human body antenna in wireless implant communication. The application of the human body for wireless implant communication was studied theoretically; therefore, future research should support the theoretical results with experiments. The analysis of the human body antenna characteristics in this thesis was based on the implicit assumption that the human body is not moving. The movement of the body changes the antenna characteristics, such as, the antenna pattern and directivity, which have effects on the gain of the human body antenna. The human body antenna features can also be applied in areas, such as, the implementation of the human body antenna for RF energy harvesting in the FM band. Studies have shown that the ambient RF power in the FM band is mostly higher than other broadcast bands; additionally, it is continually present unlike other intermittent broadcast channels. The future researches can also focus on the prospective application of the human body antenna to connect wearable electronic devices to nearby monitoring devices. This application can be deployed in a network of HBC devices without the need to include a power-hungry central hub operating at a higher frequency to communicate with the nearby external monitoring devices..
Future work will investigate models of WBA-SAR with a grounded human body. The ability to give almost any object (human, animal, plant, rock, or robot) an antenna affords them to have a communication-sensitive skin. This promises to open many possibilities for entities to better interconnect with their assets - and make them more responsive to manufacturing needs to the global beast system. “Researchers Create “Spray On” 2-D Antennas,” by Michael Koziol, IEEE Spectrum, 21 September 2018.